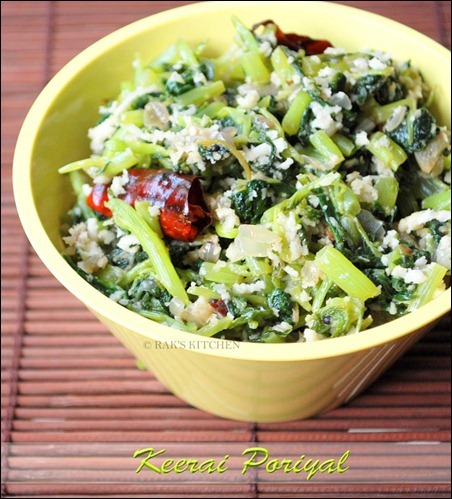 Keerai poriyal recipe with step by step pictures. 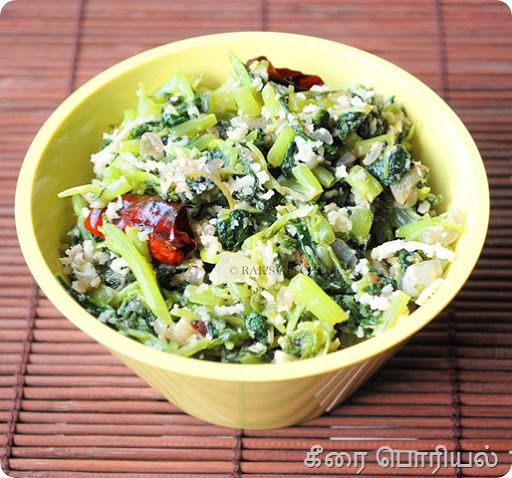 Simple side dish for a tamil lunch menu. With coconut adding flavour to it, the side dish is very mild in spice. This is a very very simple to make recipe, my family loves it next to keerai kootu. I find making keerai poriyal simple than kootu or sambar, just stir fry the keerai, that’s it. An accompaniment is ready! I am so confused with the names of the keerai, I am not sure if this is mulai keerai or arai keerai…but this has long stem which is edible,sometimes we use it to make keerai thandu sambar too. I make it as no onion no garlic too many times. tastes good still. If you need volume, you can add onion and even some grated carrots like my Mom in law does. Clean the keerai and remove the root part. Wash it properly and chop finely along with the stem. Chop onions and cut garlic to thin circles. Heat a pan with oil and temper with the items given under ‘To temper’ table. Add chopped garlic and fry till its starts turning golden in colour. Add onion and fry till transparent.Sprinkle sugar, in goes keerai and required salt. Stir slowly as the keerai reduces in volume as it gets cooked,it leaves water,so no need to add any water. Keep the flame in high so that the water evaporates, as the keerai gets cooked. Cook till the stem gets cooked,you can notice it turning translucent comparatively after it gets cooked. Keep stirring to avoid burning as we cook in high flame. Lastly add the coconut and stir well until you get a dry poriyal. Do not cook the keerai covered as it will lose its colour. Also adding sugar helps to retain green colour, lock flavour. You can also use cooking soda a tiny pinch to retain it's colour. But make sure it is metal free cooking soda. Garlic is optional to add, so feel free to omit if you don’t want to add it. Clean the keerai and remove the root part. Wash it properly and chop finely along with the stem. Heat a pan with oil and temper with the items given under ‘To temper’ table. Add chopped garlic and fry till its starts turning golden in colour. Add onion and fry till transparent. Sprinkle sugar, in goes keerai and required salt. Keep the flame in high so that the water evaporates, as the keerai gets cooked. Cook till the stem gets cooked,you can notice it turning translucent comparatively after it gets cooked. Keep stirring to avoid burning as we cook in high flame. Lastly add the coconut and stir well until you get a dry poriyal. Enjoy with rice as accompaniment. We even eat this by mixing with rice and ghee/sesame oil. I do not mind cooking Keerai if someone else cleans it for me..I find the cleaning part so daunting! !Love the green colour,good tip of not closing the lid while cooking.Got to learn a few things about Keerai now!! Healthy and yummy poriyal. Lovely presentation. Love this simple keerai poriyal, just give me some rice,am ready to finish that whole bowl..
Naanum ippadithan seiven but seeragam add pannuveen. Poriyal looks delicious…. 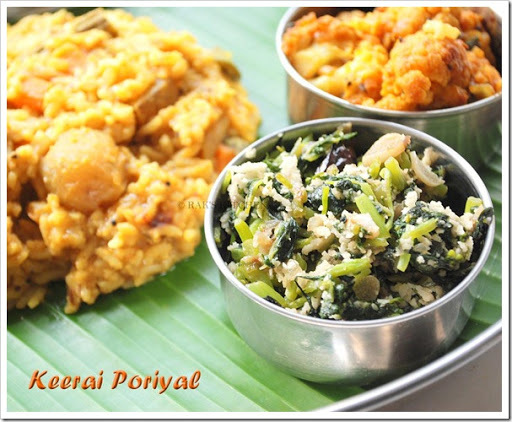 never tried poryal with keerai..its always masiyal at my place..looks yumm..will try this sometime.. Very nice clicks and nice recipe too!! Great looking poriyal. Nice photos. BTW we call this keerai in telugu is totakura one of my favorite lefy vegetable. This looks same as what we make "cheera thoran". I love this a lot. Yummy and delicious. It is one of my favorite poriyals. A good one, I too prepare in a similar fashion sans garlic :):)Lovely eye capturing click. This is so healthy and simple! Superb I too make same way but without onion and garlic. Looks delicious. Love keerai in any form. Looks Yummy! Keerai poriyal and kara kulambu is a nice combo, we normally will not add garlic to the poriyal. I am going to try adding them when I make next time. The last click is more authentic. missed lot of your posts. that omum biscuits are just perfect. love love love it. bookmarked. nice side dish for rice….very yummy! Healthy and delicious poriyal,love it. A simple keerai,gets a special make over when it comes to Rak's Kitchen.Lovely keerai. This is my first visit to your blog and I surely have to say you have an amazing blog….since I'm very new to this blog world do visit my blog at http://onlyfishrecipes.blogspot.com/ and let me know your valuable comments ! happy to follow ur blog ! Delicious and simple poriyal…love it!! Final pics takes my breath away… As u say, bisibele bath with keera….hmmmmmm ..divine..
My mom makes it similarly – she addes some jeera too. Easy & tasty! Healthy and delicious..i am great fan of greens..ur looks very inviting! I love keerai a lot and do similar way too. The platter looks yumm.. and Thandu keerai and Mulai keerai are same, former one is bigger in size while next one is Smaller in size. But Arai keerai is different one. Nothing beats a simple homey dish like this..good one! a very healthy recipe.. i make in a similar way.. by the way that rice looks too delicious.. sambar rice / rasam rice? Poriyal looks delicious. I make it in the same way,except garlic. looks very healthy n yummy.. I am always in search of this kind of healthy stir fry with greens..looks delicious..
i tried most of ur receipe its delicious and even its very easy to make. Poriyal came well. It was yummy. Thank you. Thanks for sharing..have spinach ..will try today..